What Happens If I Fail My CDL Test? 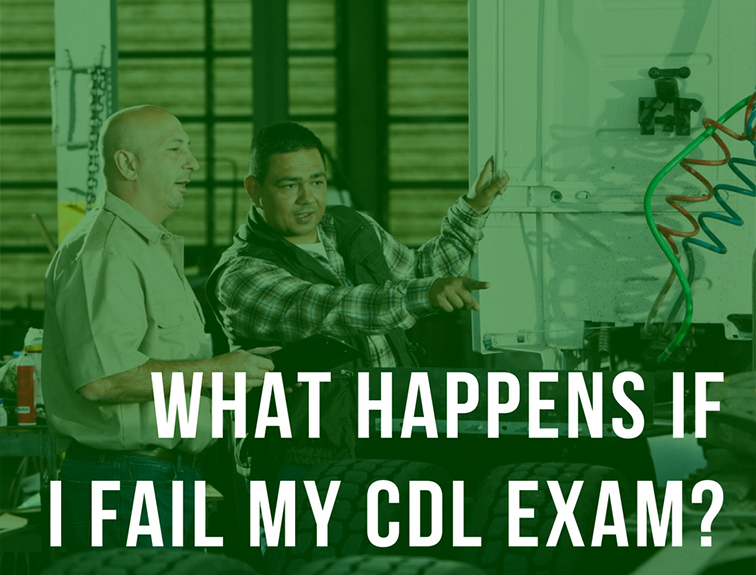 Failing the CDL test is something many students fear. The truth is, some people do not pass their CDL test the first time they try. If you happen to fail the driving test the first time you take it there is nothing to panic about. What Will Happen If I Fail? The instructors at Diesel Driving Academy will prepare you to take your CDL exam. However, if you happen to fail the exam the first time, we’ll help you review what you missed so you are better prepared next time you take the exam. To pass the CDL exam you will need to get an overall score of 75% on the tests. You will need an 80% on the driving portion of the exam. Are There Other Requirements to Pass? You will also have to pass state or federal requirements to get your CDL license. These requirements may include obtaining a CDL permit, a DOT physical (doctor’s exam), pre-trip test, basic skills set test, and a road test. The state or federal requirements you must adhere to will depend on where you live. Don’t worry – staff and instructors will go through everything you’ll need to obtain your CDL. When you complete your requirements for your CDL, you will receive a “Certification of Completion” from the Diesel Driving Academy, along with your CDL License!